There are few kits that allow you to build two-stage rockets, but there is only one that allows you to build a three-stager: the Comanche-3! The Comanche-3 is a classic kit introduced many years ago by Estes. It was later removed from the catalog to make room for other kits, but the fans have always felt great nostalgia for this simple kit with incredible features. Came back since some time in its "mini" version for 13 mm motors, the Comanche-3 now returns to its original size, for 24 mm and 18 mm motors, with its long and thin body and able to reach the highest altitudes if launched with all of its three stages. The assemblying is very simple because the rocket consists of a few basic parts: the fuselage divided into three parts, balsa fins to be glued in place, and a plastic nose cone. But it is during the flight that the Comanche-3 gives the best of it: first, you may decide to launch it in a three-stage configuration, as a two-stager or single-stage depending on the space available or the impression you want to make on the people attending the launch. Then you can decide which engine configuration you prefer, and even whether to launch the first stage with the third, or the second and third together. Recovery of the last stage is made via a plastic streamer to prevent the wind to bring the rocket too far. The two first stages return to the ground slowly simply by the aerodynamic drag of their fins. The Comanche-3 flies with a C11 or a D12 engine in the first stage, and an A, B or C engine in the second and third stage. The possible combinations are really a lot. You can use both Estes engines or Klima. If you really want to dare the maximum you can use Klima D9 engines in the second and third stages, but make sure you have a group of friends ready to follow the flight, to increase the chances of seeing it. At that altitude it becomes almost invisible! 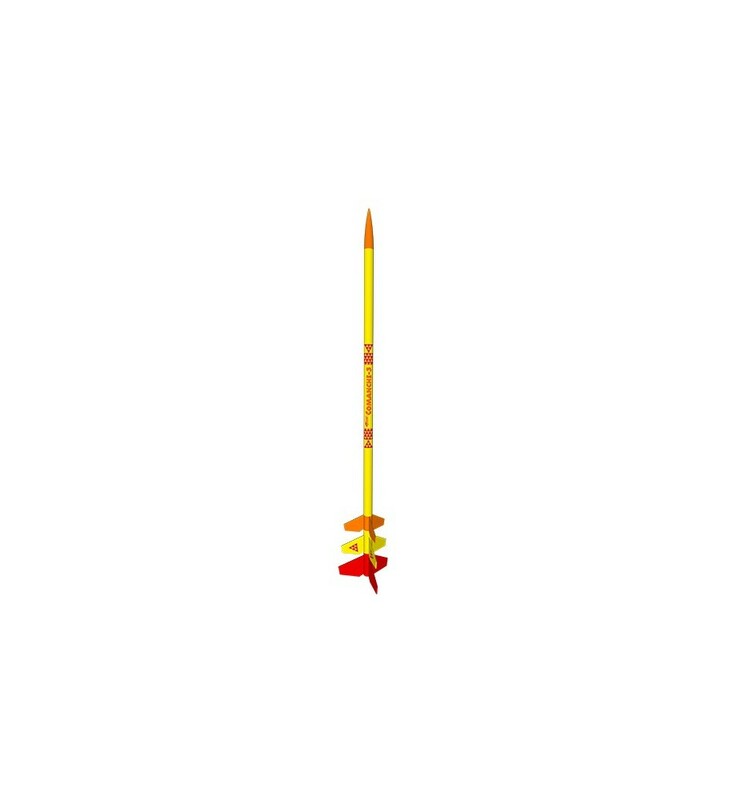 To launch the Comanche-3 you should use a launch pad with a launch rod of 5 mm, like the E-Estes Launch Pad. In case of two-stage launches with only 18 mm (A, B and C) engines you can use the typical launch pad with 3 mm launch rod like the Estes Astron II Launch Pad or the Estes Porta Pad II. For ignition you need a standard launch control, as the Estes Astron II or Klima Launch Controller. Motors, starters, launch pad and launch control, batteries and paints are not included.